Fancy some nice music? Here is a short recommendation from me. As a Dublin tourist having been here already you may remember a nice walk on Saturday at Grafton Street and its famous street music from several highly talented bands. One of thes is Key West which I listened to often when I passed the busy street. The played at sunshine, rain, cold and rainy weather. Always with such an empowering energy and empathy that those moments listening to them really made my day. Now there new album “Joyland” is out and it turns out to be really successful climbing up to number 1 in Irish charts. I am really happy form them because I really appreciate the love and energy they put into their tunes. So if you want to listen something really original from Dublin and create a little street music atmosphere for yourself, just listen to their new album here. Recently some incidents occurred that made be re-think my way of consuming music. Mostly the kind of music to go. Raised up in the analog age where a walkman was a walkman and not simply a branding for mobile devices proving some music features like playlists or boom bass. (Pretty ridicolous when you know a sound of a ghetto blaster). 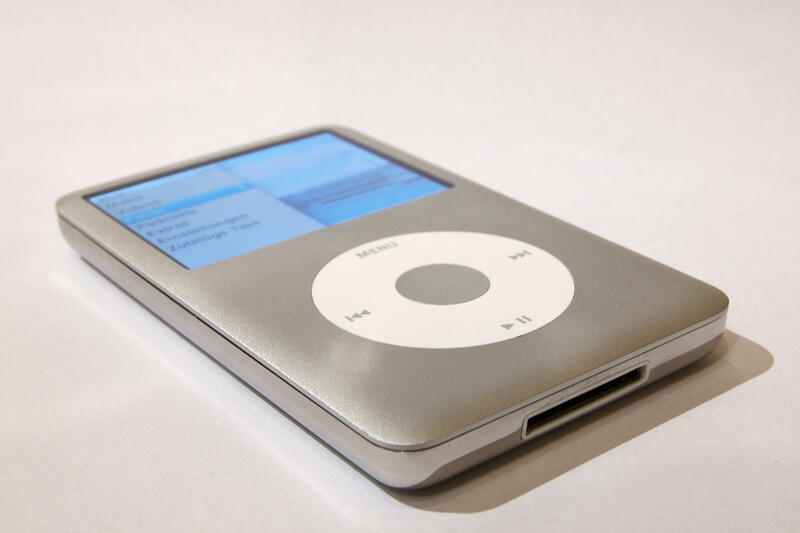 One of these incidents was the announcement by Tim Cook to stop development and production of the iPod classic due to lack of spare parts. This suddenly drove me to use my beloved 30GB 2nd generation device more than usual and I sometimes noticed myself touching it in a tender way. Since this announcement I do take care for this dying species knowing that soon there will be no possibility to get it repaired if something should happen. But what should happen apart from an water incident by too much rain or just by gravity? This tiny fellow with some 3K songs I carry along with me while commuting to work works propperly and is not showing any sign of weakness. It is great because of its simplicity. It is literally classic. The very, very most important thing which makes this device a classic device is the lack of internet connectivity. This is really the point. Honestly – I have not been aware of it or haven´t even thought about it since I recently read a quote from Haruki Marakumi. In his book “What I talk about when I talk about running” he talked about what kind of device he uses while running cause he enjoys listening to music. He prefers using a MD player instead of using a mp3 player. His reason for this is that he thinks that music and pc do not fit together. They should be seperated. This was the second incident cause it made me think and I agree 100% even if I do not adapt this totally because I still use my iPod classic. To me it is more about listening to music and being at the same time connected to the internet is not the right thing. It disturbs the real interaction with the songs having in your ear. You lose your focus on what you listen because you divide your attraction. To be frank. For two years I was a heavy user of spotify with a premium account. I absolutey loved this app running on my smartphone and tablet. Specifically I loved the possibility finding and listening to old records which I do only own on vinyl like e.g. Foreigners “Head Games”. I did not use the playlists cause I prefer to choose my own kind of music but the variety of music is amazing. Commuting by train, cycling to work or walking the dogs – I took my phone, started the app and began searching and searching. I started a song, listenened to it for 2 minutes, skipped to a next one and had already the next artist in mind. But I did not listened to one single, complete album like I did in the past. More and more I felt lost cause I did not really know what I wanted to listen next. The choice is too overwhelming and causes a overstimulation. Additonally while being online by nature I answered emails or responded on social network interaction. I was not with the artist. Don´t get me wrong and I know it sounds oldschool (a consequence of my age for sure) – I do understand and appreciate all the advantages of streaming music. Mostly you have a big choice, flexibility and you save much money (even not so good for the artist cause they do suffer because of this low price policy) but – because I really do like to listen to an album, I prefer listen to it without anz kind of distraction. So I went back to my iPod classic. No Wi-Fi, no bluetooth, no 4 G or any other thing. Just pure music. Now when I bought an album (I never used file sharing cause the quality is disgusting) it feels a bit like in the old times when I e.g. listened to the Back in Black album the very first time after Bon Scotts death. It was like heaven and I did not skip any song. I worked myself through from “Hells Bells” to “Rockn Roll ain´t no Pollution” This is how listening to music should be. I do it less now – but with more intensity and joy. Streaming music is like having fast food. I prefer a propper dinner and a nice glass of wine. Finally the co-Operation of LiebnerZapple Project and fjuz made a new song covering the social media topic of hashtags in a freaky crossover version. Official living-room-dub mix. Made in Dublin, Ireland. Check out the video. As well available on soundcloud. We had fun. Klasse dachte ich. Ein Buch über Seelenverwandscnaft. Von einem Soulmate. Am Ende musste ich ernüchtert feststellen, dass diese Ansammlung von persönlichen und subjektiv guten Song Kritiken doch recht oberflächlich sind. Das cover des Buchs bildet eine Kassette ab. Dieses vermeindliche Mixtape könnte aber auch gut eine Reinigungskassette darstellen, die leise und ohne Aufregung dahinplätschert. Schnell gelesen, da ohne wirkliche Tiefe. The device overload at home is moving forward and forward. The central access point is the router which is connected to tv, stereo, smartphones, tablets even radios in the kitchen – and my apple tv box. Not really new. Got it now for nearly 2 years and I frequently use it. For me living in other countries it is an excellent opportunity to watch German news magazines or reports (delayed) or videos on the tv screen – not on my laptop. I love watching live concerts and the itunes festival is a perfect possibility to watch various artists all performing in UK´s Roundhouse at Camden. Well known acts as well as (for me) totally unknown. Love it. Perfect sound quality and a great club atmosphere because of a not too large location. And surprise, suprise. It is totally for free. Watch it until the end of October. Recently listend to Agnes Obel and Bahamas. Great artists which I added to my spotify or deezer playlists. Crazy online world.